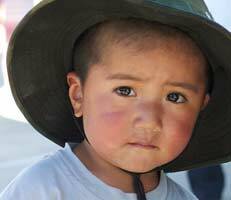 As one of the poorest countries in Latin America, Bolivia must confront a number of problems: infant mortality, child labor, limited access to education in rural areas, etc. 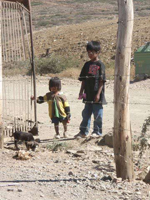 As a result, Bolivia faces a difficult situation requiring further improvement to the lives of young Bolivians. 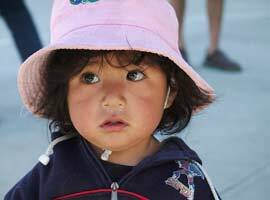 According to a recent survey, there are more than 4 million children and adolescents in Bolivia, a vulnerable group that represents 44% of the population. 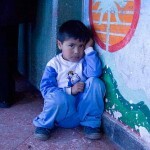 Bolivia is among the poorest countries in Latin America. This extreme poverty, particularly in rural areas, affects different groups, whether girls, boys, or the women of the most disadvantaged indigenous groups. This level of poverty affects their quality of life and limits their fundamental rights – such as access to clean drinking water, access to education, and the right to live in an environment that permits personal development. Bolivia has the largest number of indigenous people in Latin America. These people are the victims of significant inequalities in society and are considered vulnerable groups whose human rights are at present frequently undermined. Indigenous children, aware of the importance of education, are highly motivated to improve their living conditions, not just for their own benefit but for their families. Nonetheless, their opportunities are limited by inadequate education infrastructure, including the near-total absence of teaching materials and libraries. Excessive alcohol consumption – and the violence that accompanies it – is a problem throughout their lives. Food supplies are often inadequate and basic sanitary infrastructure is lacking. For example, in many cases access to the nearest hospital is only by river. In 2006, the government of Bolivia created the school voucher system « Juancito Pinto » – an annual allocation of funds for each child’s education. Its goals include an increase in enrolments and a reduction in the number of children dropping out of school, but also a longer term reduction in poverty. It seeks to lessen the burden of indirect costs of state education, like learning materials and transport. The voucher system targets children in the eight years of primary education at government-run schools nationwide. In 2010, a new education law was adopted, « Avellino Siñani », which seeks to adapt and improve the relationship between indigenous culture and languages and the national education system – without compromising standards overall. Despite all these innovations, there still remain serious inequalities between urban and rural areas, indigenous and non-indigenous populations and between men and women. According to the most recent figures, an indigenous girl living in a rural area will complete just two years of education. where a non-indigenous child living in a city will on average complete 14 years of education, progressing to higher education. Migration towards cities due to rural poverty has become a new source of family breakdown… Children affected by violence or poverty at home run away to live on the street. This is one of the most complex situations for the country to resolve, because it not only involves a disruption to the child’s development but also poses a threat to the stability of society. Street children are an extremely vulnerable group, exposed to risks like exploitation in the workplace, the consumption of drugs and alcohol, crime, human trafficking, and sexual and other types of violence. In July 2014 the re-elected vice-president of Bolivia, Alvaro Garcia Linera, adopted a new law permitting child labor from the age of 10 years. Previous legislation permitted children to work from 14. Bolivia is, therefore, the first country to legalese child labor from so young an age – a situation which is in violation of several international agreements ratified by the country. According to the most recent statistics, at least 27% of children and adolescents aged between 5 and 17 years work at least one hour a week, and 26.7% of children aged 14 and under carry out work that is dangerous, whether by its nature or by its uncertain status – for example, working in mines. Up to date statistics are not available, but according to recent reports, 80% of children, girls and adolescents are victims of violence, whether physical, psychological or sexual. 30% of children are victims of psychological violence, 60% of physical violence, and 4% of sexual violence. Most of this violence occurs either in the family home or in the child’s place of work. This makes the protection of children difficult for authorities: most of the time, these criminal acts are not reported. Studies show that the level of violence exerted corresponds with the level of education received by the parents. Parents believe that corporal punishment is essential to educating a child properly: this manifests later as family based violence. Almost half of all girls aged between 15 and 19 believe that it is sometimes justifiable for their husbands or partners to hit them, as a normal part of a relationship.